Last year, Chonnam National University (CNU) failed to elect a president for the 49th General Student Council (GSC) due to the low turnout of voters. The Central Management Committee (CMC) has substituted for the GSC until the council is composed. The re-election for the GSC was scheduled to be held on April 4 at a temporary Student Representative Assembly meeting on February 28. However, some students say there are problems in detailed election-related regulations and cannot trust the Central Election Management Committee. What’s worse is that many students do not seem to be interested in the GSC election. 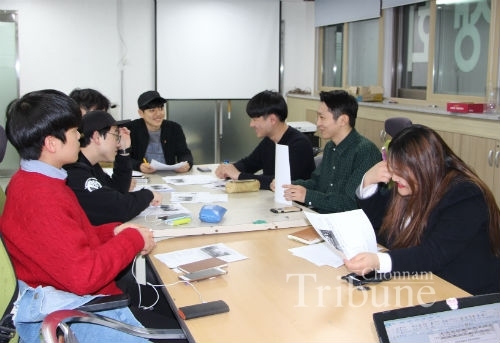 The Chonnam Tribune looked into the GSC problem and listened to students’ opinions about last year’s 48th GSC. The current vacancy of the GSC could be easily predicted because last year’s council failed to resonate with CNU students and lacked proper policies to encourage students to be involved in the activities by the GSC. It is one of fatal reasons for its vacancy. These days, students are busy caring about their personal matters and building their careers with activities such as working to get high GPA and TOEIC scores, which are essential for getting a job after graduation. They do not have enough time to keep an eye on the school organization. However, what if the GSC could come up with student-friendly policies to help them relieve stress from the burden of their daily lives? Students would surely get interested in what the GSC does for them and participate in the activities operated by the council. Although the GSC has promised to help CNU students lessen their burden and to improve their welfare and convenience in the election campaigns, many of the commitments were not actually fulfilled. It is a second factor that students had no information about the policies and activities of the GSC. Regarding this problem, the 48th GSC Vice-president Yu Chang-min (Senior, Faculty of Business Administration) mentioned that he uploaded what the council did on the Internet. “We announced our activities and issues including student union fee usage via SNS accounts using Facebook posts and blog posts. We uploaded all recordings and photos taken at meetings and some events. As for offline promotions, we used promotional materials like placards.” On the other hand, an opposite opinion also exists. Han Cheong-a (Senior, Dept. of Psychology) said, “From the time I was a freshman, I have never been told anything about what the GSC members do at all.” The placards and materials were mainly hung around Student Union 1 building where the council is located. It is hard to know whether they are doing something unless students go to that building. It makes many students indifferent to the student council, which should have efficiently provided information regarding its efforts for students. How people communicate with each other is always important in any kind of society. However, the GSC failed to communicate with CNU students and caused students’ indifference and disappointment. The above vice-president said that the GSC aims to solve various problems related to CNU members and strives to make our school better. Nevertheless, Park Gwan-hyeong (Junior, Faculty of Business Administration) said, “The GSC did not even give me any feedback when I sent them a suggestion to improve students’ lives on campus. Besides, they concentrated on external issues rather than listening to insiders’ demands. Now I am wondering what GSC is for.” The lack of communication made the student council itself lose the original purpose of its existence, and it could not rise to meet students’ expectations. In fact, they are likely to be aware of the problems. According to what the vice-president said, they know some students have antipathy towards us because of insufficient communication. However, there were few efforts to improve the communication system and in the end nothing has changed. The above-mentioned three reasons have caused students’ disinterest in the GSC and this led to the vacancy of the council of this year. If the next GSC keeps up the same mistakes as the previous one, the organization will not be firmly established. Students interviewed by this Tribune reporter gave several suggestions for the GSC. The council needs to go ahead with student-friendly policies. Kim Byeong-chan (Sophomore, Dept. of Administration) suggested, “A lot of low-income students are worried that they cannot afford tuition fees. I think the GSC can operate scholarship programs in order to financially support students with the University Administration.” The GSC has to find real solutions for problems that students are facing. This will increase student interest and participation in the GSC. In addition, all the information that students need from the council has to be offered clearly. Lastly, suggestion boxes could be a useful way to listen to students’ opinions with their complaints and claims. Every proposal needs to be collected systematically, and feedback should be sent to the students. Small improvements in the GSC will make students be involved in the council and then CNU better for students.